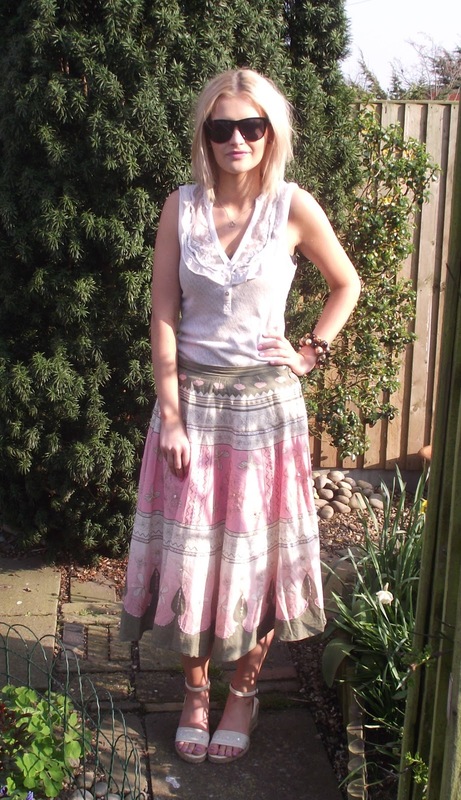 I actually got the skirt back when I was 14 from Tesco and just never grew out of it and as it's so pretty and maxi boho skirts never seem to be out of fashion in the summer I decided to get it out of my wardrobe for the 6th year in a row haha! I wore it with my cute Miss Selfridge top as it works so well with more colourful bottoms. I'm also wearing my new Primark sunnies that I got for, wait for it...a pound! and they actually fit my little face so well and keep the sun out of my eyes, what a bargain! I really like the sandals I'm wearing too as they've got a bit of a flatform thing going on, so they add a bit of height without hurting my feet. I found them in TK Maxx years ago (a great place for discovering ridiculous discounts!) and as my feet haven't grown from a weeny size 3 since I was about 13 (I really just haven't grown like I expected to...) I thought I'd rediscover my love for them again this year. What do you think of my outfit? Are you liking maxi skirts and the boho look this spring? I had to work 9-5 today so I'm just chilling out in front of rubbishy Saturday night tele tonight, but I'm very excited for tomorrow as my boyfriend's coming home for Easter :) I also wanted to say a massive thank you to all my followers and everyone reading this for supporting my Budget Boutique and helping me to reach over 200 followers, you are all too lovely and really help to boost my confidence with blogging! So much in fact that I think I might start my youtube channel tomorrow, scary but exciting stuff! I hope you are all having far more exciting Saturdays! Love it! That skirt is fabulous on you. I'm a huge fan of the boho chic. The top is so cute and you look fabulous.